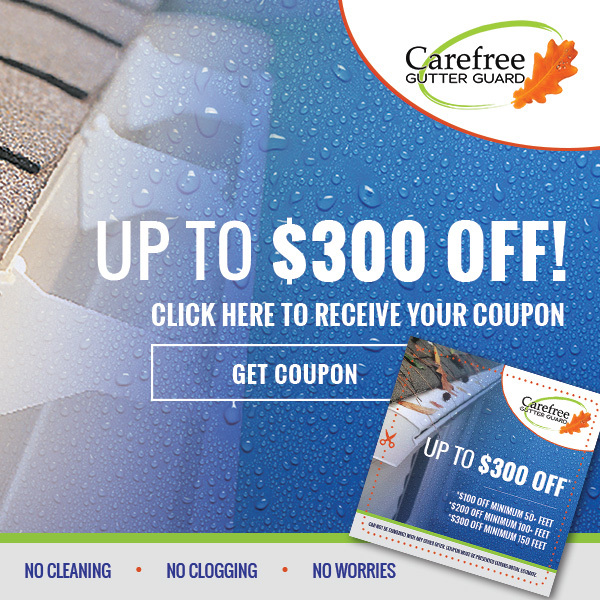 Leaf-Free, Clog-Free, Worry-Free Gutters from Carefree Gutter Guard. Serving Hampton Roads & Greater Richmond. Our gutters are hung using a proprietary hanger that gives our gutters incredible strength. Our gutters are mounted so securely that they can easily support the weight of the installation crew hanging off of them! We are the exclusive installer of the K-Guard Gutter System, which employs a proprietary two-piece design that keeps leaves, dirt, and other debris out of your gutters! Virginia can get some pretty intense rain. That’s why our gutters are 5” across and are capable of moving nearly a gallon of water per foot! When the next big storm hits, you can feel confident knowing that your gutters are doing their job! Our gutters are backed by a lifetime labor, material, and performance warranty. When you choose Carefree Gutter Guard, you’re choosing a company that stands behind its work. Since 1999, thousands of Virginians have trusted us to install and repair the gutters on their home. Our quotes are fair and transparent- with Carefree Gutter Guard, you don’t have to worry about a surprise bill! Founded in 1999, our company has mastered the art of gutter installation and removal. Every year we install tens of thousands of feet of gutters- we’d love to add your home to the list! You’ll find our crews in Hampton, Virginia Beach, Portsmouth, Chesapeake, Suffolk, Williamsburg, Newport News, Norfolk, Richmond, Ashland, Chesterfield, Petersburg, Glen Allen, Goochland, and Fredericksburg and the surrounding areas. Nearly 20 years of service makes us your gutter experts! Our installation crews work year round and can accommodate your schedule. Our gutters are backed by a lifetime installation warranty. That’s right: lifetime! We aren’t a big-box contractor. As a family-owned business, you can count on us to earn your business and trust. Since 1999, our gutter installation crews have installed more than 1 million feet of gutters in the Hampton Roads & Richmond areas! With dozens of happy customers added every month. Thousands of feet added every month. With numbers like these, it’s no wonder we’re considered one of the best! The K-Guard Gutter System: America’s Strongest & Simplest Gutters… Guaranteed! The K-Guard Gutter System – available exclusively through Carefree Gutter Guard – is a fully-integrated Leaf-Free system. There is no other comparable product on the market that offers the protection, strength, durability, water drainage capacity, and attractiveness of the Carefree Gutter Guard system. Using patented industrial-strength hangers and an oversized 5” trough, our gutters are guaranteed to never sag and are capable of properly draining water during even the most torrential of storms! Combined with a smooth, curved appearance that adds beauty to your home’s exterior, we think you’ll agree that our gutters are the best solution available in the Hampton Roads and Greater Richmond areas! Unlike pre-packaged “off the shelf” gutters, which come in set lengths and intervals, our gutter system is custom-made for each home we install them on. This means a perfect fit that blends seamlessly into the home’s exterior. We service Hampton Roads and the entirety of the Greater Richmond Area. Looking to finance your new gutters? Ask us about our financing options! Enter for Your Chance to Win a New Gutter System! Every month we’re selecting one lucky household to receive FREE gutters for their home. Registration is simple and once you’re registered, you’re registered for life! Why would we give you FREE GUTTERS? It’s simple: We love our customers and want to share this amazing system with you. We are the gutter experts, so next time you think gutters, you’ll think Carefree Gutter Guard! Visit our great gutter giveaway page to see *complete contest rules and enter. Follow us on Facebook to keep up to date with contest announcements. *Winners will receive up to 150 feet of gutter / 60 feet of downspout valued at up to $1,250! Expert Gutter Installation by Seasoned Vets! Our installation team is the industry leader when it comes to the safe and efficient installation of our gutter systems. With thousands of installations under our belt, we know better than anyone how to properly remove (and recycle) old gutters and install your new system… in less time and with less hassle! The Last Gutters Your Home Will Ever Need! Lifetime warranty against clogging – say goodbye to clogged gutters forever! 5” Oversized design can handle even the most extreme rainfall- up to nearly a gallon of water per foot! Available in heavy-duty aluminum (color matched to your home) or 100% copper. Patented installation method results in the world’s strongest gutters that never sag!